Happy Friday everyone! We are all finally feeling much better from the cold and cough that has been spreading around. I am looking forward to spending more time outdoors this weekend. 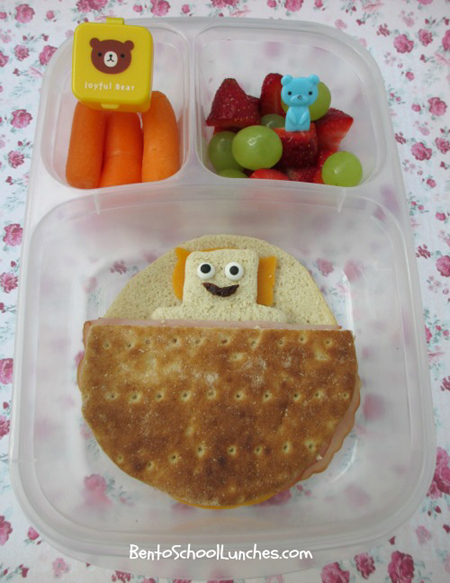 This bear under blanket bento was inspired by my artistic friend Yenny over at Mommy of twins. Have a wonderful weekend:) Check out my $50 Amazon gift card blogiversary giveaway here. I used whole wheat round sandwich thins for the bed and blanket. The top part of the blanket was turned over and cut into bear shape. Bear's head is resting on colby pillow, candy eyes and raisin mouth. Organic baby carrots and ranch in little bear container. Seedless green grapes and strawberry pieces. Packed in EasyLunchboxes container. What a cute theme and the bear is just adorable! Such a cute little guy all tucked in!